During the early 80s Canada was quite prolific in churning out these types of slashers inspired by the success of John Carpenter’s Halloween and this 1981 horror is one of the more renown titles, along with Prom Night and Terror Train, mostly for it’s inventive kills and last act surprises. Happy Birthday To Me tells the story of young college student Virginia (Melissa Sue Anderson). She’s one of Crawford Academy’s Top 10, a group of 10 elite senior students who rule the school. But, someone is stalking and killing the members of the Top 10 in gory fashion. And with Virginia’s birthday approaching, will there be anyone left to celebrate a day already darkened by a horrible accident that years earlier claimed the life of Virginia’s mother and almost cost ‘Ginny’ her own life as well. 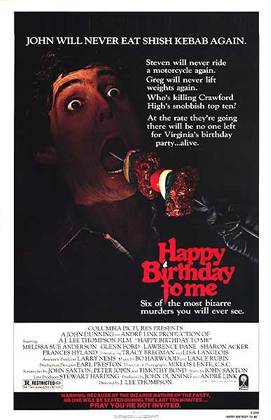 Obviously these incidents are connected as this does follow the 80s slasher formula quite well with past events provoking the current bloodshed but, Birthday manages to throw us some surprises and curves within the formula even when we think we have it all figured out. The film is directed by straightforward filmmaker J. Lee Thompson who is mostly known for The Guns Of Navarone and numerous Charles Bronson action flicks but, it was probably his work as director of the original classic Cape Fear that got him this gig. As such, Thompson directs fairly by the numbers and the first two thirds of this flick are moderately paced, as were many of the horror thrillers of this era. I also feel it’s about 10 or 15 minutes too long as the this portion drags on a bit and at almost two hours, the flick is lengthy for a type of film that usually clocks in at around 90 minutes. Potential victim’s are quite obvious so, there is little suspense but, the unusual and quite bloody kills, which were still new for slashers around this time, make up for the routine style and approach. It’s a little more then halfway through when things start to get interesting as we are given a big reveal that leads us to believe one thing but, as the last act progresses and we think we’ve figured it all out, the climax throws us some nice curves. Even upon revisiting it… and I haven’t seen this flick in decades… I found myself still fooled as the surprise ending wasn’t quite the way I remembered it and thus still had some effect. The cast are, unfortunately, all pretty wooden, though in their defense their characters are all fairly two dimensional as well. Movie veteran Glenn Ford does give us his usual strong work as Virginia’s psychiatrist Dr. Faraday and leading lady Anderson perks up in the last act as things start to really liven up and the script gives her more to chew on. The gore effects are well orchestrated and there is certainly a lot of bloodshed, which signaled the changeover was in full swing from the more moderate violence of Halloween and some of it’s predecessors toward the more graphic gore of flicks like Dawn Of The Dead (which seemed to kickstart the following 80s gore trend), Maniac and Friday The 13th. Gore and body count would soon become more the focus of the 80s horror flick over chills and suspense and this was one of the first slashers to actually promote itself based on it’s kill methods not it’s story or twists. So, overall the first two thirds of this flick are fairly slow moving and generic though with some inventive and quite bloody kills but, it’s in it’s third act and climax that things really start to pick up and we get some twists and surprises that are a bit over the top but, more entertaining because of it. There is now some good 80s nostalgia too that helps liven up Thompson’s very direct approach and simple style and the ending still works after all this time. Happy Birthday To Me is considered a classic of this era, and while it’s not a great movie, it is one of the more famous flicks of the time period slashers, even though when looking back at it now, the kills and violence don’t seem like that much of a big deal after all that has followed it. 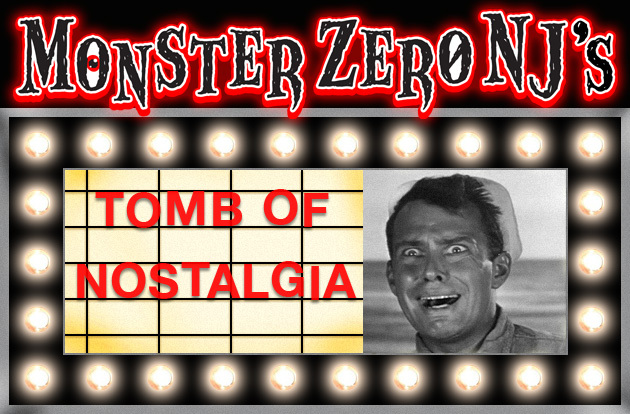 Back in the day, it made an impression and should be recognized for that and is definitely required viewing for those of later generations who are finding themselves broadening their horror horizons or are simply fans of the horrors of this time. A cult classic and rightfully so, as it represents it’s era well. Also stars Canadian actor Lawrence Dane, known to genre fans from Scanners and Bride Of Chucky, as Virginia’s father.